Have you ever used pork carnitas to make your taco meat? I’m telling you, it is the most tender taco meat you will ever experience. I have not been able to find it at all grocery stores, but it is worth doing a little research or asking the butcher to cut it for you to get the results you will get using it in this recipe. Where I live, I have been able to find it at Winco. I have also made this recipe with chicken and other cuts of pork, but pork carnitas deliver, by far, the most tender outcome. This is a very simple, throw-it-in-the-crock-pot-and-move-on-with-your-day recipe that tastes delicious when the dinner hour rolls around. We actually had it for Christmas this year because it is one of the few recipes that my whole family enjoys. So, without further adieu, I give you Crock Pot Green Shredded Pork Tacos. 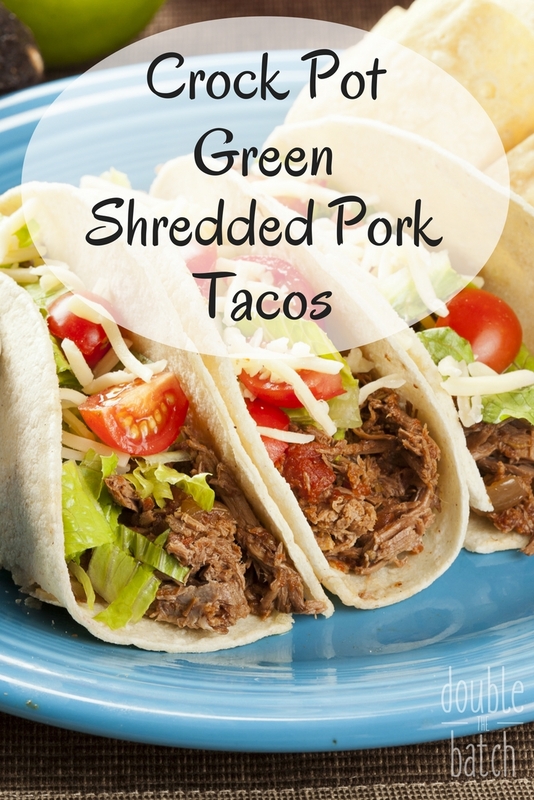 Savory and tender green pork tacos, shredded to perfection after a few hours in the crock pot! Add the green chile enchilada sauce, chopped cilantro (use less or more depending on how much you like cilantro), diced garlic, cumin, and carnita meat to the crock pot and squeeze in the juice of one lime. Every crock pot seems to cook differently, so I hesitate to tell you whether to put in on high or low. Go with whatever usually gives you the most tender result. I usually cook mine low and slow- so on low for 7 hours. When the meat is done, shred it using 2 forks and leave it in the juices. If I use corn tortillas, I heat a little vegetable oil in a large frying pan and heat the corn tortillas on both sides. Add shredded meat and the toppings I listed or your toppings of choice to the tortillas and enjoy!